to the National Museum and Art Gallery as was approved and directed by the National Executive Council in January 2007.
part of a final win-win solution to rebuild a significant piece of our nation's democratic history. There have been many attempts in the past that have not materialised for various reasons. Attempts to achieve that objective failed even though considerable funds were raised and assigned to the project. The neglect continued and the building became more derelict to the extent that a demolition order was issued in June 2005. 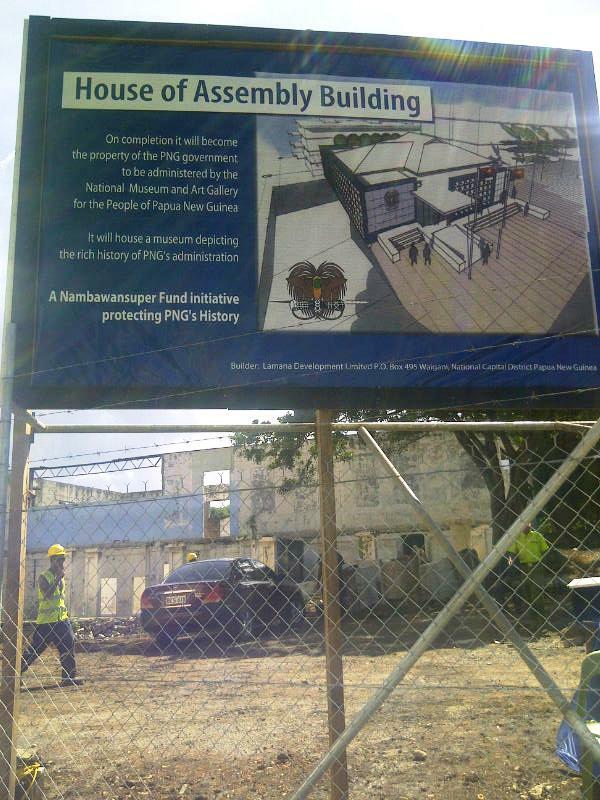 A press statement back in April of 2006 created the seeds of an idea which would see the old House of Assembly reborn as a memorial and a museum dedicated to the birth of democracy in PNG. That statement related to the disappearance of K300, 000 raised for the renovation of the old house. Not a toea was spent, the report said. That article highlighted the sad state for the old House of Assembly. Since it was ravaged by fire, many former staff or their relatives along with new squatters converged on the property and demolition were notices issued by National Capital District Commission. National Executive Council in 2007. The extensive internal due diligence process that followed also took time to ensure probity by Nambawan Super. In fact, it has taken five years, but at last there is now action happening with clearance of the site with builders now mobilising on site to start work. We have spent close to Kl million in land rent payments to the state and in getting the site ready for improvement. We are pleased to be able to play a significant role in restoring a place of our modern history where the birth of our democracy took place. This will be a historic place where many of our citizens, our children and visitors can visit, reflect and hopefully be inspired. As a significant national project, the process will be inclusive and will involve consultations with all key stakeholders including the trustees and management of the National Museum for technical details in the internal reconstruction of the House of Assembly. We will be developing the rest of the land for commercial development. I am pleased to announce the winner of this year's UNESCO/DWU award for communication and development. The winner is Malum Nalu from The National newspaper. Since the emphasis at today's celebration today is on digital media, we would like to especially acknowledge Malum Nalu's contribution to digital media through his blog site: Malum Nalu blogspot. His site is updated daily with news of interest to his local and international audience. It certainly lives up to its aim of promoting PNG and what it has to offer. He incorporates news written by journalists and comments by visitors from around the world. The information on his site has been through the professional and ethical filters that apply in his workplace. One of the problems with blogs is that there are no generally accepted standards of ethical practice, so in many blogs gossip and rumours are portrayed as facts. We certainly encourage everyone to express their opinions as citizen journalists, but the lack of journalism skills by many writers does not improve the overall quality of the online news content. Opinion does have its place, but we would like to think that a new professionalism is possible amongst the digital revolution. Since Malum Nalu is not with us here today, we are happy to present this award digitally, and we now invite him to respond digitally. TRADE, Immigration and Foreign Affairs Minister Don Polye has signed a bilateral accord on Tuesday that would remove obstacles to Japanese investment in the Pacific country rich in natural resources such as liquefied natural gas and copper ore, The National reports. Japanese foreign minister Takeaki Matsumoto and Polye endorsed the pact in Tokyo, with the two expressing hope that the accord would deepen bilateral economic ties. In a meeting with Polye following a signing ceremony of the investment treaty, Matsumoto said Tokyo would try to ratify the accord soon. The Japanese minister also expressed gratitude for donations of K10 million by Polye on behalf of the people of PNG to support Japanese victims of the March 11 9.0 quake and tsunami. The two countries launched negotiations on the investment pact last September after then Japanese prime minister Yukio Hatoyama and his Papua New Guinean counterpart Sir Michael Somare reached an accord to start the talks in March last year. During the talks, Matsumoto told Polye that Japan, which faces energy shortages due chiefly to the ongoing nuclear crisis spawned by the twin disasters, hoped that Papua New Guinea would be a stable LNG supplier for Japan. Polye said from Tokyo that PNG would ensure that a LNG development project, in which JX Nippon Oil & Energy Corp is involved, would run smoothly. About half of some 6.6 million tonnes of LNG to be produced annually from the project is scheduled to be exported to Japan. Meanwhile, a statement from the Japan embassy in Port Moresby said it hoped that the signing of the bilateral investment agreement would further boost the economic development of PNG and affirm the bilateral relationship of the two counties. “The agreement will contribute to enhancing legal stability for investment and promoting investment between the two counties as well as people-people exchange. “It will also contribute to further strengthening the economic relationship with PNG which is being more important to Japan as a supplier of LNG,” the statement said. NOT all public servants will benefit from the 7.5% pay increase signed between the Public Employees Association and Department of Personnel Management yesterday, The National reports. Under the new memorandum of agreement, seven government organisations involved in service to the people are excluded in the payout expected on May 18, the 10th pay day of the government payroll system. More than 35,000 public servants will be entitled to the salary increase. Department not included in the award are police, Correction Services, Teaching Service Commission, Defence, Ministerial Services, National Forest Authority and the National Judiciary Services and Magisterial Services. Public servants in other departments and government organisations will benefit from salary increases for the next three years. Public Employees Association president Michael Malabag said a 6% salary increase plus a 1.5% increment based on productivity had been agreed too. He said the package included a consumer price index threshold given by the government to cushion any fluctuations of CPI. He said this would be determined “from time to time”. He said recreational leave fares to employees would be made available after every two years for a public servant and his family. Malabag said the association had rejected the government’s buy-out offer of K500 per annum for the K20 fortnight housing subsidy. He said the association was negotiating for a K250 fortnightly accommodation allowance and would pursue the matter before the public service conciliation and arbitration tribunal. He said the government’s home ownership scheme was vague and a long-term plan that would benefit and solve the housing problems of public servants. But, Malabag said other matters such as retrenchment/ retirement agreement, reduction of 35% tax on terminal benefits, compulsory life and health insurance cover, risk allowance and review of outdated allowance rate provided in the general orders would be negotiated at a later date. DPM secretary John Kali urged all public servants to perform their duties diligently. He said the people really needed their service and with the increase in salary, they should perform better. The new agreement covers a three-year period of annual increases. 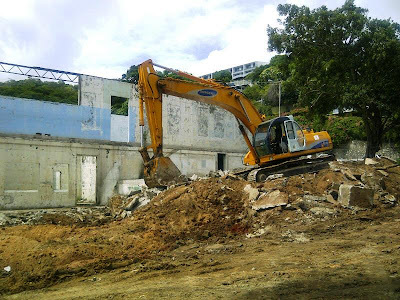 THE torn-down old House of Assembly in downtown Port Moresby is to be rebuilt and dedicated as a museum to the birth of democracy in Papua New Guinea, The National reports. Superannuation fund, Nambawan Super Ltd (NSL), is the major shareholder (65%) in a joint venture with the Lamana Group that will construct a replica of the old House of Assembly. NSL chairman Sir Nagora Bogan said in a statement yesterday that, when completed, the building would be transferred to the National Museum and Art Gallery at no cost to the state. In return, the joint venture would be given an adjacent subdivision of the House of Assembly land to develop for its own purposes. The statement sets to rest conflicting messages reported this week that the site might be turned over to private interests to use for their purposes, a view that was supported by the culture and tourism minister and the management of the national museum. The plan for a private consortium to build a replica of the old House of Assembly was agreed to by the national executive council in January 2007 but internal matters of due diligence that followed to ensure probity by the Nambawan Super took time, Sir Nagora said. When completed, the replica of the old House of Assembly will have on display old photos, statutes and other memorabilia such as who designed the national flag and who wrote the national anthem. Former culture, tourism and civil aviation minister Charles Abel, who had quite a bit to do with this idea in his time, said: “We wanted not just to restore the House of Assembly but to have a living, moving theme. Sir Nagora confirmed this in his statement: “We are pleased to be able to play a significant role in restoring a place of our modern history where the birth of our democracy took place. He praised the Lamana Group for its part in the project. “We have had a number of successful joint ventures with the Lamana Group which has delivered positive returns and value to the fund. Many attempts have been made in the past to restore the building but none had materialised. Considerable funds were raised and assigned to the project to no effect. In July 2006, a notice for eviction and demolition was published. 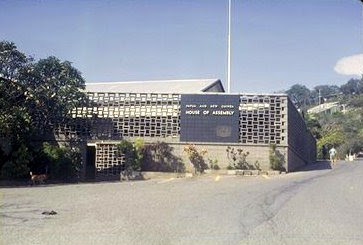 A press statement in April 2006 created the seeds of an idea which would see the old House of Assembly reborn as a memorial and a museum dedicated to the birth of democracy in PNG. That statement related to the disappearance of K300,000 raised for the renovation of the old house. Not a toea was spent on restoration, the report said. That article highlighted the sad state of the old House of Assembly which had been ravaged by fire. Many former staff, or their relatives, and new squatters converged on the property and demolition notices were issued by NCDC. Sir Nagora said the joint venture had spent close to Kl million in land rent payments to the state and in getting the site ready for improvement. He said the rest of the land would be developed for commercial use. “Nambawan Super is leading the project and acknowledges that it will be in PNG hands with our members benefiting both in commercial terms and for restoring a major part of our nation’s history,” he said. WATER and power was restored to Port Moresby residents at 1pm yesterday after Koiari landowners reached an agreement with the national government and NCDC, The National reports. ﻿﻿﻿﻿ The landowners agreed to accept K500,000 instead of the K1.5 million they had demanded. They then handed over the keys to the Rouna II hydropower station. By 8pm last night, electricity and water were fully restored to the capital city. The keys were given in exchange for the payment, which would be used to facilitate talks between the landowners and the national government over outstanding memorandum of understanding (MoU) issues. NCD Governor Powes Parkop said the K500,000 from the City Hall was not to compensate for the death of Koiari leader Umaia Koeari. It was to help the landowners begin negotiations under the established task force committee and ensure a memorandum of agreement (MoA) was reached. He said he would join the task force team, set up by the national government, to address the grievances the landowners had with the state in order to solve the matter once and for all. He said compensation payments by the government would set a precedent for future demands when similar incidents occurred. Parkop said the K1.5 million compensation requested by landowners should be paid by the perpetrators responsible for Koeari’s death and not the government. Koeari was killed on April 19 at Hohola 3, Port Moresby. Parkop thanked acting Prime Minister Sam Abal, Higher Education Minister and Kairuku-Hiri MP Paru Aihi and Finance Minister Peter O’Neill for their help in reaching a quick resolution to the water and power crisis in the capital. “I am happy that an agreement has been reached, and power and water supply restored,” Parkop said. Aihi thanked his people for taking the boldness to address the issue. “Koiari people have been neglected for too long,” he said, stressing that a MoA was needed to secure commitments on their behalf and the government to fully realise its positions on the agreement. He said Abal and Attorney-General Sir Arnold Amet had assured their support for the people. Both PNG Power and Eda Ranu officers thanked Parkop for resolving the dispute. Landowners cut water and power supplies to Port Moresby on Tuesday. PNG Power workmen were filling the head pond and penstock before water could go into Rouna 1, III and IV power stations to start generating electricity. Linesmen were working on a fallen line that caused a blackout last night and disrupted the starting of auxiliary equipment at the power stations. Beneath giant rain trees that lined the perimeter of the cemetery were hundreds of neatly lined granite headstones on manicured lawns. They reflected faint light in the in the cool misty morning air. This was Bomana war cemetery, at the ANZAC day dawn service on the 25th April 2011, to commemorate Australian and New Zealand service personnel that lost their lives in major conflicts and especially World War II which was more relevant to PNG. It was a quiet, perfect and sombre moment to reflect on life generally, and to remember our own fragile mortality and to remind one’s self of where we fit into the massive scheme of the things in history, time and space. As the ceremony drew to a close, I left the crowd and wandered down the rows of graves, with the lone bugle call of the “Last Post” resonating in the background, in the early morning misty dawn and amidst the morning cries of the “kigahoc” birds in the tree tops. I wandered on, a little bemused yet sadly sorry by the names and ages engraved on the upright, granite headstones that marked the graves. Maybe it was the sombre moment, but what struck me next and welled silent tears, was when I crossed the line of the graves of an the unknown soldiers. For them - the daily prayers offered by their mothers to the Almighty, for the return of their sons, was not to be. Their inscriptions on granite slabs simply read, “Known only unto God” - a stark reminder of the often senseless nature of war. It was these very thoughts that ran through me, and to well those silent tears. It was the tragedy of war – my thoughts went out to the mothers, fathers, brothers, sisters that will never what really know became of their loved ones. Driven by the call of the British Empire, they left the comforts of their home and took up arms to rage a war in tropical jungles in a foreign land against a fearful enemy exaggerated maybe more so on propaganda. Despite all that war historian and books will tell you - one really has to wander what the war was really about - what was it really for – you’d have to be almost insane to leave the comforts of your home, bundle off to a foreign land and fight a meaningless battle against an enemy you did not know nor really understand what had driven them to war. However what has always been painfully apparent was the lack of appropriate recognition by the colonial regime, of the significant contribution of the Papuan soldiers, carriers and even indigenous Australians who served and lost their lives. They only feature in the far corner of the cemetery, amounting to 30 so headstones, but segregated away from the mainstream. Papua New Guinea's elderly leader Sir Michael Somare is said to be recovering in hospital after undergoing surgery. Sir Michael has been in Singapore on medical leave for the last fortnight and there have been rumours the 75-year-old had died. But his spokeswoman and daughter, Betha Somare, says Sir Michael underwent surgery last week and is recovering well. "He remains a fighter and will be around for many years to come," she said in a short statement. No further details of the surgery were released. In another statement, Sir Michael's deputy chief of staff Leonard Louma said the leader will remain in Singapore until he is fit enough to resume his duties as prime minister. A lot of controversy and misinformation has been circulating in the press regarding the “Old House of Assembly” and the future of the site and the building. As President of the Board of Trustees of the National Museum & Art Gallery I wish to clarify the situation that now exists by providing some hard facts to dispel rumors and misconceptions. These are the facts that people should consider, regarding the recent history of the “House of Assembly” and the actions taken by the Government to safeguard the site and to replicate the original “House of Assembly” on that site. These may not be what the public perception is at the moment, but it is the truth of the matter. Firstly, there is nothing left of the original building that can be saved and refurbished. • The Old House has had a varied history, originally built in 1905 as a hospital in early colonial times. Eventually it became the First Legislative Assembly between 1958 and 1960, and four years later it became the full House of Assembly. It was extended at various times and after independence in 1975 it changed name from House of Assembly to National Parliament. • In 1992, the Central Provincial Government was granted a Business (Commercial) lease over the land where the Old House of Assembly was located. By this time they had abandoned the building for Konedobu where they actually moved to in 1990. • Between 1990 and 1996 the building was left unattended by any official government authority and illegal tenants moved in. The building suffered severe vandalism during these time and two fires consumed 90% of the building in 1996. • The fires crystallised attention on the Old House of Assembly and a public outcry galvanised government action and the NEC in 1996 by its Decision No.182/96 rescinded the earlier decision No.27/90 resolved to transfer the custody of the Old House of Assembly from the Central Provincial Government to the National Museum & Art Gallery. The same decision carries a Directive to the NMAG tasking it with restoring the Old House of Assembly and developing it into a political museum and a historical monument. Following the NEC decision the Minister for lands granted a lease on the property to the NMAG in February 1998. • It is a sad fact that the management of the NMAG and the leadership became weakened by politics and self-serving interests and obviously lacked the inspiration, willingness and energy to see this restorative project implemented. Even after the NCDC Building Authority issued a demolition order on the buildings in June 2005 they waited for a year for the NMAG to respond. When they failed to do so , they published the Demolition order in the National on the 26th July 2006. • This period marks the “Dark Ages” for the NMAG, with ineffective and corrupt management that did not just neglect its duties but actively acted contrary to the safeguarding and preservation of our culture, monuments and artefacts. • The NEC, in its wisdom, resolved to take action and by its Decision No 30/2007 to approve the proposal by OPH Limited to replicate the Old House of Assembly and have that and the land it sits on handed over to the NMAG as the State Agency that is to be responsible to preserve the “Historical Centre” and that OPH Limited have the remaining land granted to them. • The remains of the OHA are not existing to be refurbished – it is physically impossible to do so – and so a new building, replicating the old, will be constructed and given to the NMAG. It will be developed at a cost equivalent to the market value of the whole Section 8 Allotment 11. Basically, the NMAG and the people of PNG are getting a replica of the Old House of Assembly at no cost to the state, and as far as the NMAG is concerned it is in fact selling part of the land to finance rebuilding the Old House of Assembly. In view of the situation that existed in 2007, the NEC acted in the best interests of the NMAG and the people of Papua New Guinea by the actions it has taken to safeguard the site of the historic building and at the same time creating a monument to the birth of our Nation. This land that the Old House was on is not just any lease-hold land and it should not be traded and bought and sold as any other lease-hold property in the land. It is the womb in which the Nation of Papua New Guinea was developed and grew before its birth, and the Government should take whatever steps necessary to protect it and this it has done through NEC Decision No. 30/2007. The current Board of Trustees is very much aware of its duty and is doing everything in its power to return the NMAG to its proper role. We have now identified the only Papua New Guinean educated and qualified to run the Museum, we have overcome challenges and court actions by the past management and are now waiting for our political masters to officially appoint him in this important role. Farmers across the world feel with justice that their cut of the total retail value of the crops they grow and sell is a small one. A wheat-grower on the prairies of Canada, an apple-grower at Stanthorpe in Queensland, a coffee-grower in an isolated village south of Okapa in the Eastern Highlands; all are disposed to hold a grudge against “the middle-men.,” and few if any understand the nature and the truth of the chain of trade which begins at their farm or coffee-garden and ends with a consumer in a far-away land. In the case of our 400,000-odd coffee-growing families, here in Papua New Guinea, who are the middle-men who handle the coffee they produce? ﻿ What do the middle-men contribute as coffee passes along the chain of purchase, transport, transformation into a consumer product, distribution, and ultimate sale in small units, in packets and cups, to consumers? Is the coffee grower in PNG getting a fair share of the overall market value of his coffee? The short answer to the question is “No!”. 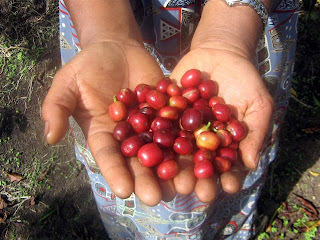 But our PNG coffee-grower is not alone. The same answer – “No!”- applies to all coffee-growers within all the “origins”- all the coffee-growing countries, world-wide. Here in PNG as in other “origins” the grower, the roadside buyer, the coffee factory, the transport and insurance companies and the exporters all together share little more than 12% of the gross value of coffee sold at retail in packets or in cups at shops around the world. The coffee- importers who are the agents or the clients of our exporters make a margin of about the same size as our exporters and for this they carry the risk of loss or damage or spoilage in transit, for landing and clearing through customs and quarantine and then storage and delivery to the roaster who has ordered the coffee. The importer is basically a risk-manager who must find substitute coffee which is acceptable to his client if something happens to stop the shipment from PNG or to spoil it or damage it in transit. Many coffee-roasters insist in just-in-time deliveries so that they don’t have to support big stock-holdings, and this responsibility is also born by the importer who sometimes even supplies storage silos and conveyors, installed in a clients factory, and keeps them full 24/7. The small shops and cafes make a relatively small amount. A huge 80% is shared between the consuming country- based roasters and their marketing agents and the major supermarket chains. For instance, our small grower out beyond Okapa will laboriously carry his dry “pasmen” (parchment) coffee, sometimes a foot-journey of two or three days because all the outer-district roads are in such bad shape, or are non-existent. He will either sell it to a mobile buyer at nearest road-head, or pay a truck-driver to carry it to Goroka where he will get a much better price. In Goroka, today, he may get around K7.60 to K7.80 per Kg. for his dry parchment.If he is registered with one of the organic or fair-trade marketing groups he may receive another 30 or 40 toea per kilo. Most factories in the main centres pay a bonus to help cover the cost of transport, and our bush farmer will certainly make sure he gets this before he pays the truck-owner what is due. As of this week he may have a little over K1000 for his three bags or 150 Kg. of dry “pasmen” to spend or take home with him. A time when the hand-roads leading out to remote areas in the highlands used to light up in your headlights at night with reflections from all the broken, empty SP Brownies lying there. Because his coffee is reasonably clean and dry the factory buyer has given our grower the best price he can. In this process there are costs for labour, electricity and fixed costs. But there will also be a loss in weight corresponding to the weight of excess moisture, skin and dust plus any bits of foreign matter such as sugar-cane skin etc which all will be removed, thus reducing the weight of the finished product, but also making it more costly. 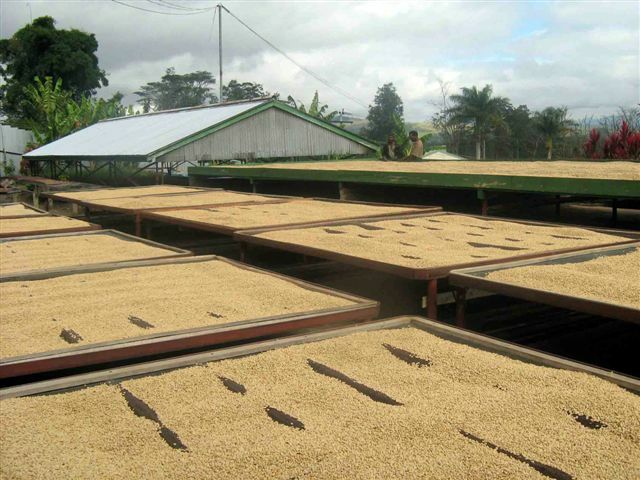 This cost will be governed by a typical-( for good, dry” pasmen”) 30% processing loss where the clean coffee is packed into 60 Kg. export bags and weighed. Weighed out at 70% of the inward or “pasmen” weight, on a per-tonne basis, what was bought for K7, 800 for 1000 Kg. as “pasmen” is now reduced in weight and has cost K7800/700 being K11.14 per Kg as green bean. The factory will now sell the green bean to an exporter in Goroka for around K13.00 per Kg. at current late-April market price.Thus the grower has made something over K7.00 per Kg. for his dry coffee delivered to Goroka, and the factory-owner has grossed K13.00 per Kg, less cost of coffee at K11.14 per Kg, being a gross margin less running-costs of K. 1.86. The exporter who puts together shipments blended together to present an evenness of quality, packs the coffee, conveys it to Lae, insures it, pays the CIC levy and customs and shipping agency costs will make a net profit after all costs of around K0.25 per kilo or around K, 5000 per 21 tonne container. At the other end of the scale we might be tempted when living in Australia as this writer does, to order some beautiful-certified organic fair-trade coffee from the Purosa area south of Okapa. This is available from a number of online suppliers including COFFEE SHRINE of Melbourne who are asking a mere AUD44.00 per Kg. for the Purosa-sourced organic fair-trade product. Now even allowing for the landed cost including sea-freight of about AUD0.9 cents per Kg, plus wharf and handling costs, coffee agents markup, delivery to COFFEE SHRINE’S factory, roasting-loss of about 20% in weight plus packaging, this is not a bad markup, is it? The finished article will have cost no more than AUD 28.00 per kilo at the outside, allowing COFFEE SHRINE a gross profit of around AUD16.00 per kilo of the finished, roast and packed coffee. Turn this into Kina and the figure is K42 per kilo, or six times as much as the grower back in distant Purosa received per Kg. for the raw product in the first place. This gives a good idea of the way the total retail value of coffee is shared between the various elements in the chain of production, export, transport, import and finally roasting, preparation, packaging and sale at retail. I have visited one or two of the shops allied with big world-wide charities which are large retailers of certified and fair-trade coffees. I have asked about the margins they make and have been told,” Oh, we keep our costs right down and use all our profits to support poor people in third-world countries. The answer was to the effect that I obviously didn’t know what I was talking about. Ostensibly humanitarian and very greenie/tree-hugger- orientated, it is in fact not at all efficient in terms of what it says it sets out to do. Pandering to inner-city fashionistas’ fancies, this market may run for 10 years or so, but already it is under the pressure of the accentuated prices of this year. Exporters are finding it hard to sell coffee loaded with an extra premium, and in less-profitable times growers tend to sell to whoever offers the best price, not necessarily a certified or fair-trade-linked buyer. In spite of these truths the fact remains that growers can achieve better prices more often than not by becoming certified and holding their coffee for sale to the relevant buyer. If this sector was more practical it would work hard at getting interested growers to group, building both knowledge and determination so that they are able and willing to effectively lobby for improved roads, hire trucks and establish central storage sheds. They might then set up and maintain simple effective standards for quality, thus growing their reputations so that better prices are received over the long term. 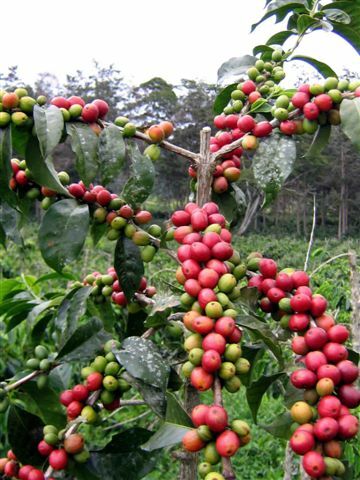 The re-planting of all the old and partly-dead trees dating from the 1960s’ explosion of interest in coffee is another area where lively and well-directed grower groups may provide a much –needed lead. One hopes all this will be accomplished under the new, generous and ambitious World Bank-funded coffee programme. This looks as though it is going to be business-like and work positively without re-inventing wheels, - ( many of them square wheels, anyway) - as so many consultancy and aid-driven coffee and cocoa projects have done over the past 20 years and more. Don’t forget that you are dealing with a multi-faceted subsistence system, not farming-as-a-business. Motivation, aims and outcomes are not what you’d expect in, say Peru or Colombia where growers are small businessmen whose full focus is on coffee production as the one means to live. THE Public Employees Association has raised concerns over the slow progress of the K38 million housing development package for public servants at 8-Mile outside of Port Moresby, The National reports. PEA president Michael Malabag said after two years, only 10 houses had been built from the promised 200 houses per year. Malabag, who is also the PNG Trade Union Congress president, stated in his correspondence with Department of Personnel Management (DPM) secretary John Kali, that since the government was advocating home ownership for public servants, the PEA must be more than convinced that this process would be transparent, affordable and within a specific period of time. “I say this because when Peter O’Neill was Public Service Minister, he announced a housing development package of K38 million in partnership with Strongbond International to build 1,000 houses over five years or 200 houses per year,” he said. “Two years, on only 10 houses have been built at 8-Mile and I have yet to sight the actual criteria, number of public servants who have applied. The PEA president said this in his letter responding to Kali after the salary fixation agreement signing on April 14 was aborted due to PEA’s opposition to the K500 one-off buy-out housing allowance instead of the K250 a fortnight claim by the union. Kali had stated during the meeting that housing was not a condition of employment for public servants and that housing allowance was not a negotiable matter, and that the government would proceed with its decision to add K500 across the board to all salary scales. He said for this purpose, the government had approved home ownership allowances, which would be announced in due course. Under the current housing agreement, the government would assist public servants with K80,000 to participate in a buy-back home ownership scheme with the remainder to be met by an individual through their superannuation savings. Kali said 200 houses were being built at 8-Mile for public servants to apply and buy and more houses would be built under the scheme where Malabag had raised concerns on the snail’s pace of the scheme. MOTU-Koita chairman Miria Ikupu has thrown his support behind the striking Koiari landowners, owners of the Rouna hydropower and Sirinumu dam in Central, The National reports. Protests by the villagers had stopped water and electricity supply reaching Port Moresby and the surrounding areas since Tuesday. Services were reportedly restored by late yesterday afternoon. Ikupu said in a statement yesterday that the national government had to honour the memorandum of understanding and memorandum of agreement signed over the years with the landowners who had, since World War II, sacrificed their land and resources for the development of the city of Port Moresby. He said like the people of Motu-Koitabu, they continued to suffer on their own land with the government providing them with false hopes and promises. “I am in agreement with what the Koiari landowners have demanded in their petition, but the demand for the government to pay K1.5 million is very little, a tiny drop in the Sirinumu dam, let alone the ocean, as this money should be a monthly payment compared to the PNG LNG project,” Ikupu said. He said while he pitied the Koiari people and their plight, he praised acting Prime Minister Sam Abal for directing the reactivation of the inter-agency task force to address critical issues raised in the petition raised by the Koiari landowners. The chairman said the LNG had taken precedence while the people, who have contributed so much in the enormous development of the city of Port Moresby and the country, had been given empty promises. Ikupu called on the landowners not to give in to any sweet talks until and unless their demands were met. “Likewise, as human beings and citizens of this beautiful country, we must have respect for mankind. It is about time the government introduces the Vagrancy Act which not only restricts the movement of people but make Port Moresby a peaceful city for everyone,” he said. “The people of Koiari and Motu-Koitabu must be treated the same with other landowners in the country who enjoy gold, copper, oil and other resources because land, water and power are our only resources,” Ikupu said. PUBLIC servants can expect their much-anticipated pay increase of 7.5% in their pay packets next pay day with housing benefits still a contentious issue, The National reports. The pay increase will be backdated to January this year. The K500 accommodation subsidy buy-out will be implemented by the Department of Personnel Management (DPM), but will not be included in the salary fixation agreement for this year to 2013 to be signed this morning between PEA president Michael Malabag and DPM secretary John Kali. Malabag, in a letter dated last April 19, responding to Kali’s letter of April 15, stated that PEA had opposed the government’s “buy-out” of allowance plan which it viewed as inferior and was not in line with the union’s claim of K250 on top of the current K7 subsidy rate. Malabag said: “I will take into consideration your letters stating that the government will proceed with its intention to apply K500 across the board to all salary scales and that the general order accommodation subsidy will cease forthwith, although it will not be included in this agreement. “PEA will pursue this matter with the public service conciliation and arbitration commission with the intention of reaching an amicable resolution,” Malabag said. He also welcomed the consumer price index (CPI) clause in the agreement, to be added as a protection against inflation projections, which was an added bonus on the salary adjustments. Malabag said both DPM and PEA must reach a separate agreement on other matters such as retrenchment and retirement, reduction of 35% tax on final payment of entitlements and compulsory life and health insurance cover and risk allowance. The official signing ceremony for the 7.5% pay rise for public servants, slated for April 14, was deferred due to differences over housing conditions. The government had approved a 6% increase with an additional 1.5% for productive performance. On top of that, the government had decided to make a K500 one-off payment in housing allowance. However, the PEA had demanded a K250 fortnightly payment. In his letter on April 15, Kali stated that because housing was not a condition of employment for public servants and an allowance was, therefore, not negotiable, the government would proceed with paying K500 across all salary scales and effective from the date of implementation, it would also cease the general order accommodation subsidy. “This decision is of significant benefit to the lowest paid employee and should not be denied to them,” Kali stated. The K7 allowance per fortnight for public servants had been in the general orders for decades. Some of the bronze plaques on the Coastwatchers Memorial Lighthouse in Madang were stolen and taken to Lae to be sold as scrap metal. Fortunately, the culprits were caught and one of the plaques (pictured) was returned to Madang where David Faithful, from Lutheran Shipping willingly cleaned and polished it up and it will be re-installed in the near future. Another plaque remains missing and I have requested requested any information that could lead to the recovery and re-installation in memory of the Coastwatchers who served in PNG and other Pacific Islands. 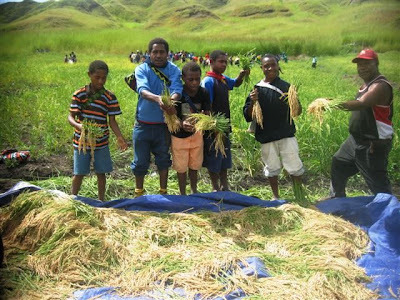 STUDENTS attending Korofeigu Primary School in Lower Bena area of Ungai-Bena district, Eastern Highlands, had a rare experience in rice farming. The opportunity was created for grades seven and eight classes by Kinigito Community Association just before the school closed for Easter break. Teachers and students were taken to the Kinigito rice farm where they were allowed to harvest rice at the farm. Each student was given a handful of rice seeds to be planted at their respective villages. Kinigito Community Association secured funding from the Department of National Planning to venture into rice farming as a solution to food security problems. 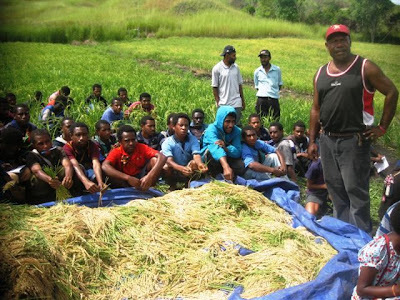 President of Lower Bena local level government, Jerika Haki, emphasised that rice had become staple diet for the people.He said they want to ensure students mastered the art of rice farming so they could cultivate rice to cut down on the imported stuff. “Food security for Lower Bena area has been one of our main priorities after experiencing drought, which saw us facing serious shortage of food,” Haki said. Haki said rice could be stored for longer periods than other staple food crops like kaukau (sweet potato). He thanked Kinigito Community Association for accepting the students to learn how to harvest rice at the farm. “We gave each student a handful of rice seeds that they will plant in their own garden,” Haki said. Alex Bare the technical advisor of rice growing with Eastern Highlands provincial natural resource division provided technical information on rice to the students. Several students asked questions on rice growing that were answered by Bare. National Agricultural Research Institute will be hosting its Agricultural Innovations Show at the Sir Alkan Tololo Research Centre at Bubia, outside Lae, next Thursday, May 5. This day also marks NARI’s 14 anniversary. The event is organised around the theme “Investing in Innovative Agriculture for Prosperity”. “The nation has the need, great potential and vast opportunity to prosper through innovative agriculture, and enhance the focus on investing in innovative agriculture. “The theme is in line with NARI’s efforts to encouraging consistent investment in agriculture, particularly in research to develop technologies and innovations, which are crucial agents in innovative agriculture and rural development. “With the economy projected to grow at 8.5 % and the LNG and other related projects coming on stream, PNG has a more-favorable environment and opportunities now than ever before for all stakeholders to make positive contribution to innovative agricultural development, in general, and to research, science and technology, in particular. A heavy downpour didn’t deter showgoers at the 2010 show, as seen in this picture at the Brian Bell stall. Chief guest of the event will be Paru Aihi, Minister for Higher Education, Research, Science and Technology and guest-of- honour will be Morobe Governor Luther Wenge. “This year’s show will involve demonstrations and displays of materials and technologies,” Dr Ghodake said. “NARI will also be officially releasing three improved technologies to the farming community. “There will be a number of government officials and the private sector representatives and other stakeholders participating. “Also participating and presenting their activities will be a number of research and development agencies, the private sector, educational and training institutions, extension providers, NGOs, and community groups. Showgoers at the 2010 show. For more information, contact James Laraki on telephone 475 1444/475 1445 or email james.laraki@nari.org.pg . Sogeri, for many years, has been a means of escaping from the sweltering heat and scorched landscape of Port Moresby. While Moresby is dry as a bone for over six months of the year, Sogeri, invariably, is moist and green and its mountain air cooler. It goes without saying that when one goes to Sogeri, one returns to the city very much relaxed, and reinvigorated. Sogeri is a chance for residents of Moresby – often disparaged (rather unfairly) as one of the “world’s worst cities”- to get away from the stresses of the capital. It is quite ironic that, 30 minutes drive from Moresby, can be found one of the many jewels in Papua New Guinea’s crown. Flooded Laloki River cascades down Rouna Falls. We owe Sogeri, and the local Koiari people, a big word of "thank you" as it is the Laloki River on their land that supplies water and electricity to Port Moresby. In fact, the whole drive from Port Moresby to Sogeri, particularly from Bomana War Cemetery onwards, is spectacular and breathtaking, that I often why not that many people – apart from Kokoda trekkers and tourists – visit this part of the country. I feel an attachment to Sogeri, as my father, the late Mathias Nalu, trained to be a teacher here in 1956 in the same group as Michael Somare, Paulias Matane, Alkan Tololo and other great men of the country. Many close friends and family members of mine have attended the national high school at Sogeri over the years, an unforgettable experience. It was Grimshaw, in fact, who described Sogeri as “one of the most beautiful places in the world”- a view that any former national high school staff or student will subscribe to. Last Friday, I travelled to Sogeri with Tanja Meijer, who had travelled halfway around the world from Ireland to revisit her beloved childhood home at Itikinumu rubber plantation. With Meijer was Australian Alan Cullen, another child of the colonial era, who grew up in Port Moresby from 1950-1970, and for whom Sogeri was a playground. All the way from Port Moresby to Sogeri, Cullen, 60, and Meijer, 51, point out their old stomping grounds like excited children. We later enjoyed lunch and coffees at Kokoda Trail Motel, a delightful home-away-from-home overlooking the meandering Laloki River, that would test the best hotels in Port Moresby. The Sogeri Road runs close to the Laloki River, between the twin spurs of Hombrum Bluff and Varirata, passing the popular drinking hole, the Bluff Inn, on the left. A little further, on the right, can be seen the old tin smelter's works, set on the kunai-grass slopes a few hundred metres from the road. Known as the Sapphire Mine after a nearby creek, this group of workings has also been called Errol Flynn's Tin Mine. Remains of Sapphire Mine at 15-Mile, said to be stomping grounds of 1930s Hollywood star Errol Flynn. Local folklore claims he worked the mine in the 1930s. Lying at 600m and 46km inland, Sogeri is much cooler and greener than Moresby. Sogeri Road leaves Sir Hubert Murray Highway near the airport and follows the Laloki River, climbing above the gorge with a view of spectacular Rouna Falls. Soon after the falls, a road to the right leads to Varirata National Park. There is some pleasant walking here, with a network of trails, grassy picnic areas and shelters with barbecues, and lookouts giving fine views to Port Moresby and out to sea. Looking towards Port Moresby from Rouna. Wallabies are common and birdlife is plentiful. The next road left, marked by the Kokoda monument, goes to Owers’ Corner and the start of the Kokoda Trail. They are famously known as the beginning of the Kokoda Trail and are visited by hundreds of tourists, mainly Australians, every year. A family picnic at Owers’ Corner under the blue sky, white clouds, majestic mountains and lush, green environment is a moment to treasure. Crystal Rapids, where you can picnic and swim for a small fee, and Sirinumu Dam are along the next road right, or continue straight ahead to Sogeri. Sogeri, in Kairuku-Hiri open electorate, supplies fruits and vegetables to local markets, supermarkets, restaurants/hotels and large companies throughout PNG. The Pacific Adventist University (PAU) at 12-Mile produces quality farm products like banana, water melon, corn, aibika and pawpaw. Sogeri Primary Produce located in Sogeri is the largest in the Pacific. This modern hi-tech hydroponic farm grows and supplies lettuce and tomatoes to the city residents and mining, oil and gas companies. Livestock and poultry is farmed and bred at various locations. Koitaki Farm is the second largest cattle farm in the country. It provides fresh beef carcass and meat supplies to the city freezers, butcher shops and the local market. Boroma Limited at 14-Mile breeds and provides quality hog carcasses and Hagen Planters located at 15-Mile, specialises in piggery and ducks. Hugo Canning Company located at 15-Mile is the supplier of Ox & Palm corned beef, Boston, Hereford and a distributor of Ocean Blue tinned fish. Rubber is mainly grown at Itikinumu. Coffee is milled by a nationally-owned company, Koiari Holdings, which manages and operate the only coffee mill in the the Southern region. Vanilla is grown on small scale. There is a prospective gold mine at Mt Bina in Koiari. Landowners are in favour of commencing operations, whereas, other Koiari people are concerned about its impact on the Kokoda Track and the environment. Sogeri National High School holds a special place in the education history of PNG. The school began in 1944 when commander of ANGAU (Australia New Guinea Administrative Unit) Major General Basil Morris decided to set up a ‘central school for teaching natives various trades’ on Sogeri plateau outside Port Moresby. Established at the former site of the 113 Australian Convalescent Depot, the school was blessed with mild climate and green environment that was a stark contrast to the hot and dusty Port Moresby only kilometers away. The history of Sogeri has been recorded in a 342-page book titled Sogeri – The School That Helped To Shape A Nation by former schoolteacher Lance Taylor. My father, the late Mathias Nalu, was in the last teacher-training course Sogeri would offer in 1956 and included a “top notch bunch of trainees”, which included Enos Baloiloi, Lohia Boganu, Vela Kila, Bobi Livinai, Paulias Matane, Aisea Taviai, Alkan Tololo, Ronald ToVue, Waterhouse Wai Wai and Michael Tom. Michael Tom emerged from Sogeri in the 1960s as Michael Somare. Likewise, magical Sogeri remains an absolute delight, to this very day. Laloki River at Rouna after cascading down the falls. PAPUA New Guinea yesterday gave K10 million to disaster stricken Japan, The National reports. Foreign Affairs and Trade Minister Don Polye presented a cheque for the amount to his counterpart, Takekai Matsumoto, to help the Japanese government in its recovery process after the double disasters in March left 130,000 survivors homeless. 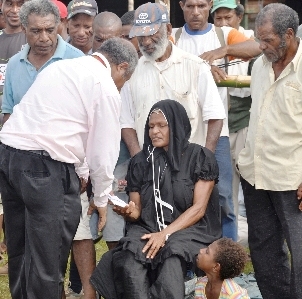 Polye, who flew to Japan over the Easter weekend, called from Tokyo on Monday night to say his visit was to officially convey condolences and sympathies for the relatives of 14,358 people who had lost their lives and 11,889 others who are unaccounted for in the earthquake and tsunami that struck the country on March 11. Polye said he conveyed the condolences on behalf of the people PNG to the people of Japan and their government. He told the Japanese PNG treasured its bilateral relations and would work to make it better. “I have come here to show solidarity, goodwill that PNG treasures Japan as an important bilateral partner,” Polye said by phone. While in Japan, Polye also negotiated trade and investment opportunities between the two nations. He reportedly made contact with Sanko-Bussan, a family-owned Japanese company engaged in the commercial fishing business which had agreed to build a loin tuna factory in Port Moresby while other investors had indicated to invest in clean energy, agriculture and technology sectors. Sanko-Bussan operates a fleet of about 90 fishing vessels in the Pacific. Polye, during the signing of the investment promotion protection agreement (IPPA) yesterday with his Japanese counterpart in Tokyo, invited potential Japanese investors to consider investing in PNG. “This IPPA signing is timely and very significant as it protects the high profile of Japanese investments to grow in PNG. “The IPPA is not a contractual obligation but it gives Japan the assurance and confidence that their investments in PNG are well assured, promoted and protected. “The IPPA signifies PNG’s commitment to Japanese investments and gives them assurance and confidence that PNG is supportive and protective of their investments,” Polye told The National from Tokyo. He said the second part of the IPPA signing was for a diversified area in particular tourism, fishery, agriculture, and information and communication technology (ICT). Polye said the Japanese were interested in investing in agriculture, fishery, ICT and PNG government had to make their investment environment conducive for them. “One of my aims is to attract more investments in PNG so that it helps our economy,” the Kandep MP said. THE National Party will fulfil the vision and dreams of its leader, the late Joe Mek Teine, president David Yak said yesterday, The National reports. While expressing shock at the death, Yak said the passing of the member for Kundiawa-Gembogl would not diminish and discourage the party. “Indeed, it should en¬courage the party to go out full swing in next year’s general election and win more seats,” he said. He said this was the dream of Teine and the party executives and supporters would not let the dreams and vision set by their parliamentary leader pass away with him. He said Teine had put the party in order and had been preparing the party policy and plans for the elections when he passed away. Yak said the party executives and supporters throughout the country were in shock because they did not believe such a thing would happen. He said Teine’s death was a big blow to the party and its supporters but that would not prevent his executives from carrying out the work he had initiated as parliamentary leader. He said Teine was an honest, committed and dedicated leader, who had the heart to serve his people in the electorate, province and country. Yak said Teine had a big vision to bring the party back to its old glory days. His father had occupied the same seat for some time in the old House of Assembly 25 years ago. Since Teine is a sitting MP, funeral arrangements will be done in consultation with parliament. Meanwhile, Enga Governor Peter Ipatas and Public Service Minister and Esa’ala MP Moses Maladina have sent their condolences to the family and people of Kundiawa-Gembogl. “I knew him as a hard working, honest, humble and a very committed leader who loves to serve the people not only from his district but the people of Chimbu and Papua New Guinea, his passing is a great loss to all of us,” Ipatas said from England where he is accompanying Governor-General Michael Ogio for his investiture ceremony. Ipatas said it was a great loss for the people of highlands region as Teine made “significant contributions towards the legal fraternity, business, politics and governance of this country”. Ipatas brushed aside rumours he had died as well. People’s Party deputy president Douglas Makana Ivarato confirmed Ipatas had accompanied Ogio to England. “It is rumours being spread by people with a vested interest,” he said. Ipatas sent condolences as well to the relatives of the late Madang administrator Joseph Dorpar, who died during Easter weekend. He described Teine as “a good man, a peace-maker and God-fearing leader who had brought Chimbu together as one people”. “The late Teine provided stable leadership to a province that has produced and lost some of our greatest leaders. “We have now lost another great leader,” Maladina said. Maladina said Teine and his team had been in the process of seeking people’s views and making major legislative reforms. He said the death of the late MP was a set-back for the Law Reform Commission and called on the commission to complete the work started by Teine. Teine collapsed at 10pm last Saturday and was rushed to hospital where attempts were made to revive him from an apparent heart attack. He died at 11am on Monday at the hospital. PORT Moresby is bracing for the worst with Koiari landowners turning off the city’s water supply and shutting down all Rouna hydropower stations starting yesterday, The National reports. NCD Governor Powes Parkop paying respect to Ruth Umuia, widow of late Umuia Koeari, who was killed at Hohola last weekend. Koiari landowners, protesting the killing of one of their youthful leaders on April 19 and the attempted murder of another in 2000, demanded immediate payment of K1.5 million in compensation before the water and power are turned back on. PNG Power and Eda Ranu have begun advising the public of heavy load shedding and water supply restrictions affecting all parts of the city of more than 300,000 inhabitants. While PNG Power conducts load shedding exercises on electricity supply, Eda Ranu will be restricting water supply to give a fair distribution of the limited amount of water available at the Bomana pumping station to NCD residents. PNG Power has indicated the load shedding exercise will be carried out for an indefinite period until the power stations are reopened. 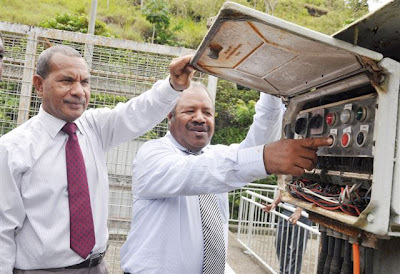 With the shutdown, PNG power can only generate 76 megawatts (MW) of electricity while the NCD’s demand is 94MW. Eda Ranu can produce 60,000 litres per day from the Bomana pumping station, which is insufficient to meet the NCD’s demand for 145,000 litres daily. In a city where water and electricity supply are intermittent at best, this action will create near panic situations in many parts. Five clans of the Koiari people, who control the headwaters of the Laloki River and the land where the Rouna hydropower projects are located, yesterday presented a two-part petition to NCD Governor Powes Parkop demanding compensation for the death and attempted murder and for a negotiation of a memorandum of understanding. *For NCD to meet cost of landowners for the duration of protest. *Government to upgrade Iarowari High School to technical school. Acting Prime Minister Sam Abal said last night that the government was prepared to discuss issues including equity participation in Eda Ranu and PNG Power, education and infrastructure but did not touch on the compensation claim. Abal reactivated the interagency task force to be coordinated by the Department of the PM and NEC to address issues such as those raised by the Koiari landowners. The acting prime minister warned the landowners of a standing 2006 restraining court order which may be served to prevent shut down of electricity and water installations. Abal assured city residents that the government was doing all it could to restore electricity and water supply to the city. According to chairman of the Koiari landowner group, Bagua Watti, until their demands are met, Rouna reservoirs 1, 2, 3, and 4 will remain closed. He said failure by the government to honour the signed MoU had led to the existing land issues. “We want answers before I hand over the keys to you (respective agencies). You better address these issues,” he said. Parkop has assured the people that the commission would not hesitate to evacuate illegal settlers in the city. He said the aim of his office was to beautify and create a peaceful city for everyone but, unfortunately, people had fallen victim to a minority. “These senseless killings must stop,” he said. Aihi, who is also Higher Education Minister, has assured the people that he would do his best to voice their grievances and bring their demands to the Somare-Abal government. NCD Central command divisional commander Fred Shekiot confirmed that investigations into the killing were continuing. Will the 2012 election be" same old, same old," all over again? I have two friends who intend to stand; one an ex-MP, the other a mature man with much valuable experience, but not politically-active in the past. Both are graduates of UPNG. I know their electorates reasonably well and find the prospect of their candidature very interesting and encouraging. Both are honest and positive men with good track-records. Is it likely that a solid and united block of idealists who are determined to return PNG to a land of fair-shares and opportunity- for-everyone will emerge and lead? A group of MPs within which there is a determination to see that justice, good health and a basic education are available to all citizens? Basic conditions in the world of 2012, and conditions which this society has a right to expect. Conditions which may be provided in this increasingly-wealthy country? How may such a trans-tribal, trans-provincial unifying representative group emerge and coalesce? The Christians, members of a potentially trans-tribal interest group, have tried and failed. One hopes they will try again. Is my suggestion, made in The National newspaper late last year, regarding the adoption of the LLG system as the foundation of national politics worth consideration by intending candidates? As is now widely-accepted, a "party-system" imposed upon a classless, landowning society has been an incumberance; a matrix for the rise of a dissatisfied and increasingly resentful electorate. In a society which has remained socially-classless and universally-landowning, with a commonality of interest and hope for the future, the first indigenous class to emerge and show its strength and influence as a unit above the commonality is the political class, which has appropriated much for itself to the loss and neglect of the mass of the people. Even the best-known politicians have made statements recognising this as a problem. How may a society which is completely divorced from knowledge and influence with the first indigenous social class it has ever seen, get out of the shadow of a shady and selfish party-system and into direct, positive, productive contact with its mausmen, its direct representatives, the MPS? Is such a set of questions and considerations worthy of the attention of this blog's readership? JOHANNESBURG: South Africa’s Harmony Gold expects its proposed new US$3-billion Wafi-Golpu copper-gold mine in Papua New Guinea to come into production in 2016, The National reports. Now in pre-feasibility stage in a joint-venture with Newcrest Gold of Australia, Wafi-Golpu is set to follow Harmony’s Hidden Valley copper-gold mine that came into production last September, also in a joint-venture with Newcrest. “Even at this early stage, we can confidently say that Wafi-Golpu is going to be a mine. There’s no doubt about it,” Harmony Gold CEO Graham Briggs tells Mining Weekly Online. The US$3-billion price tag is linked to mining taking place at a rate of 20-million tonnes a year. However, current thinking is that actual output using the block-cave mining method may be 30-million tonnes a year, which would increase the amount of capital required. The JSE- and NYSE-listed Harmony is committed to providing half of whatever capital is required. Harmony Gold’s financial director Hannes Meyer said the high quality of the grade was positioning Wafi-Golpu as a relatively low-cost future mining operation. Total cost of mining is expected to be US$25/tonne, against expected revenue of US$100/tonne to US$300/tonne, which makes it a high-margin business. “It’s really capital insensitive,” Meyer said. By 2014-15, when Harmony will have to arrange the capital for Wafi-Golpu, its South African Phakisa, Doornkop, Kusasalethu and other local projects will no longer be requiring high levels of capital and will begin generating strong cash flows, which will be able to underpin the financial requirements of the project. Also, Wafi-Golpu has significant copper, which Harmony may use for commodity-backed financing for the project. Meyer envisages that selling a third of the copper could provide between US$500 million and US$1 billion in project funding. The anticipated profitability of the business also provides scope for the introduction of considerable debt into the financing structure. “Equity will be the last route that we’ll pursue. We’ll explore all other avenues before we dilute shareholders,” Meyer said. Harmony’s Hidden Valley mine is expected to produce at a rate of 280,000oz per year for the next 14 years. The Wafi part of Wafi-Golpu is a gold-only resource and the Golpu part is copper-gold porphyry. Continual exploration drilling since 2007 indicated the potential presence of 38 million oz of gold equivalent, with recent drilling unearthing an 883m strike at 5g/t to 7g/t gold equivalent. THE Papua New Guinea Customs Commission has raised more than K1.9 billion in duties for the national government last year, commissioner Gary Juffa said last week, The National reports. Speaking at a media conference in Port Moresby, while officially launching the customs annual report for last year, Juffa said despite constraints like lack of manpower, the organisation had posted an extra K273 million (16%) in revenue for the state, surpassing the government’s forecasted target of K1.7 billion. Juffa said this was an increase of K416 million (27%) compared to revenue collected for 2009. “The increase in revenue collection is primarily attributed to the increase in international trade volume, and enhanced compliance strategies employed by customs,” he said. He said the revenue came from import duties, import GST, import excise, export duties and local taxes including inland excise and sundry collections. “I would like to thank my executives for a wonderful job last year which resulted in the organisation raising more revenue than what was expected by the government,” Juffa said. He said customs, as the entity responsible for monitoring the movement of goods in and out of the country, “will continue to protect the interests of the country and its people by detecting and preventing contraband products and dangerous and illicit materials from entering the country”. He said the work of customs was not limited to enhancing border security but involved in protecting the community, facilitating international trade and commerce and collecting government revenue and trade statistics. *The introduction of a wide range of customs user-pay service fees in accordance with the CUSTA trust instruments. CHIMBU suffered a double tragedy over the Easter weekend with the deaths of Kundiawa-Gembogl MP Joe Mek Teine and senior public servant Joseph Dorpar, The National reports. Both deaths occurred yesterday at the Port Moresby Pacific International Hospital. Teine collapsed at 10pm last Saturday night and was rushed to the hospital where he was admitted at the intensive care unit where attempts were made to revive him from an apparent heart attack. He died at 11am yesterday at the hospital. Dorpar, from Boko Kawa in Kerowagi, was staying at the Aku Lodge at Boroko when he suffered a stroke and was rushed to the hospital at about 4am yesterday. A relative said he was pronounced dead on arrival. He said Dorpar came to Port Moresby last Saturday for a business trip and was to return yesterday afternoon to Madang, but died in the morning. Dorpar was a senior public servant in Southern Highlands and was administrator of Chimbu and Madang provinces. Teine will be missed by the National Party of which he was parliamentary leader, by the PNG Law Reform Commission which he had served as chairman since September 2007 and by the people of Kundiawa-Gembogl, his Enduka tribe and his family. Teine embarked this month on an extensive nationwide tour to gauge the views on sorcery with a view to drafting new legislation for it. A relative said he had just returned from leading a delegation to Chimbu for two weeks and had been scheduled to go to Morobe on Friday but decided to stay with his family over Easter. Teine was appointed to the post after Dr Allan Marat was elevated and appointed the minister for justice and attorney-general. He was a lawyer by profession and a first-time politician although he had contested in many previous elections. NCD governor and fellow lawyer Powes Parkop last night offered his condolences and sympathy to the family and relatives of the late Mek Teine. Parkop said: “His death is a great loss to his family and relatives, to the people of Kundiawa-Gembogl and to the nation. “In his life as a lawyer, he served our people well and, in his short term as an MP, he proved that he could also equally serve our nation as a politician. Teine was preparing his party policy statement to deli¬ver at a National Party meeting this Saturday. His son Johnny will be graduating from the University of PNG this Friday. Teine is survived by wife Dala and children Emmanuel, Julianne, Johnny, Quina and three grandchildren. Agriculture is an energy conversion system in which food, fibre, biomass for fuel and processing by-products are produced for consumption and use by human society. A sufficient supply level of consumable products is necessary for the desired development and it can be achieved through enough supply of energy input and skilled man-power. The agriculture sector which is the most important sector in Papua New Guinea has neither enough skilled man power nor energy input to realise the full potential of land and labour. Traditional method of farming using hand tools like bush knives, digging stick, axe and spade are common amongst rural population engaged in subsistence farming. This practice has not been able to supply sufficient food in order to meet the growing food demand by an increasing population. The energy input through tractor and other motorised source is unlikely to meet the demand in the near future because such machines are out of reach of subsistence farmers. The utilisation of human energy in farming with improved appropriate technologies can provide partial solution; however, it is becoming clear that the rural population have given up toiling their land because of lack of support from the government. This in turn has caused migration of rural people to urban centres and projects sites with the hope getting paid employment. The energy input is estimated to be only 0.1hp/ha/yr (horse power per hectare per year) in the South Pacific including PNG. The energy input in agriculture in other developing countries like India and China is 0.7hp/ha/yr which clearly demonstrates that agriculture sector in PNG is not getting its due attention. There are some major constraints to effective mechanisation at subsistence level in PNG agriculture including: lack of credit, proper extension and appropriate technologies; lack of knowledge and skills in use, repair and maintenance of machines; lack of research and development on farm-mechanisation suitable for subsistence farmers; land being hilly and sloppy; and poor quality of imported machines. It will be wise to tackle some of the constraints in order to realise meaningful mechanisation. Focus should be on the development of appropriate technologies which could make multiple cropping feasible, generate interest for labourers in producing, harvesting, processing, storing, transporting, and marketing. The total area cultivated in PNG stands at 11.7858 million hectares accounting for cash crops (cocoa, coconut, oil palm, coffee, sugarcane) and food crops. Banana, taro, sweet potato, yam and cassava are the major staple crops. Production of rice is also picking up in many parts of the country. Farm machineries available in the country are imported. Tractors, soil preparation equipment, and harvesting and threshing equipment are reported to be the major equipments imported. Most of these machineries are destined to plantations and commercial farmers. Subsistence farmers are completely left out from the use of machines. This situation is largely due to lack of mechanisation policy on the part of the government. It is recorded that about 5,000 tractors, 7,600 soil preparation equipments, and 6,000 harvesting and threshing equipments have been imported during 1996 – 2002. This clearly indicates that machinery input is very low for crop production in PNG. On the assumption that 4,000 tractors are working at any given time, the total power available will be only 240,000 kilowatt (Kw), given each tractor is of 60 Kw. If 20 % of the land is to be made optimally productive, it comes to about 2.6 million ha. A human being is rated at about 0.1 horse power (hp) and the minimum power requirement for an effective agriculture has to be 0.5hp per hectare per year. Thus the required energy is about 1.3 million hp, which is equal to 1 million Kw. Assuming that two million people are always busy in farming, the energy input from manual labor will be equal to 0.2 million hp which is equal to 0.154 million Kw. The combined energy available from the tractors and human power is only 0.394 million Kw leaving a deficit of 0.706 million Kw. The remedy of energy deficit of such magnitude is very difficult and it should be of concern to planners and implementers. It is advisable that animal traction and two wheel tractors are in corporated in agriculture production system with appropriate technologies in order to boost the production to feed the increasing population. The following are some of the areas that could be considered to improve farm mechanisation in the country: establishment of animal traction centre, establishment of agro-service centers throughout the country, establishment of curriculum in agricultural engineering and technology at tertiary level, establishment of division of agricultural mechanisation at national level, inclusion of agricultural machines related information in agricultural extension programmes, and exemption of tax on imported agriculture machines for subsistence farmers. The above suggestions necessary to ensure agriculture production is maximised, and realise the agriculture potential that we have. 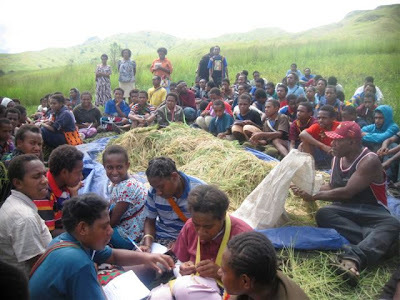 It can be concluded that farm mechanisation in PNG must be introduced at a pace that the farmers can use appropriate technology and simultaneously training and education is also pursued. This way not only the productivity of land and labor will increase but will also provide employment in rural areas.